Media relations refers to the relationship that an organization develops with media representatives to gather and distribute information. It involves working directly with reporters, as well as persons responsible for the editorial (news and features), public service and sponsorship programming products of the media. Investor relations are the activities through which an organization consciously builds relationships with current and potential investors, funding bodies, financial analysts and the media to ensure it has not only their confidence, but access to all the funds it requires at the most favourable rate and lowest fees. Employee relations involve practices that impact the management and regulation of relationships between the organization, individual staff members, and groups of individuals within the organization. Community relations involve establishing a two-way rapport with the community, raising and maintaining the organization's public profile and ensuring broad public input into the decision-making process to build buy-in and support for decisions made. Government relations is the systematic effort to influence the actions and policies of government to help achieve objectives or protect interests in a way that reflects well on the organization and the decision-makers involved. Client relations are the interactions that an organization has with its clients/users and how it engages with them to solicit feedback, provide information, consult and collaborate. A client is an individual, company or organization that is a recipient of a product, service or program. The Relationship Centered Model (RCM) has been adopted by winning organizations to examine all 6 of their key stakeholder groups to ensure the long-term success and effectiveness of the organization. Many organizations focus their efforts on managing the variables that are outside of their control of influence. While it is important to recognize that the state of the economy, the value of the dollar, unemployment rates and commodity prices have to be factored into management decisions, it is also important to acknowledge that the organization has little control over these variables. What an organization must do is manage the various variables that they have control over that impact the organization every day. This focus enables you to differentiate your organization from your competitors. There are six key relationships that every organization, (whether they are a private sector firm, a public institution, or not for profit organization) should focus on. Managing these six relationships can be compared to a juggler keeping six balls in the air at once. If you focused too much on one, chances are you will drop one or more of the other balls and the whole act will fail. With today’s social media, it is easier and more likely that a disgruntled stakeholder will make their concerns known to others. Fortunately, the reverse is also true. Satisfied stakeholders are also more likely to recommend an organization to others using social media. Media relations refers to the relationship that an organization develops with media representatives to gather and distribute information. Community relations involve establishing a two-way rapport with the community, raising and maintaining the organization´s public profile and ensuring broad public input. Investor relations are the activities through which an organization consciously builds relationships with current and potential investors, funding bodies, financial analysts and the media. Government relations is the systematic effort to influence the actions and policies of government to help achieve objectives or protect interests. Client relations are the interactions that an organization has with its clients/users and how it engages with them to solicit feedback, provide information, consult and collaborate. It is designed to assess the strength of your organizations six key relationships. The following surveys are presented as samples of the types of surveys that can be conducted during a Relationship Centered Model assignment. The following guides are presented as samples of some of the tools that are employed during a Relationship Centered Model assignment. 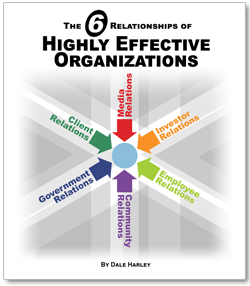 The 6 Relationships of Highly Effective Organizations is about managing organizations effectively. Many organizations focus their efforts on managing the variables that are outside of their control of influence. While it is important to recognize that the state of the economy, the value of the dollar, unemployment rates and commodity prices have to be factored into management decisions, it is also important to acknowledge that the organization has little control over these variables. What an organization must do is manage the various variables that they have control over that impact the organization every day. This focus enables the organization to differentiate themselves from competitors. About Harley House Consultants Inc.
Help our clients in managing internal and external relationships with key stakeholder groups to ensure the long-term success and effectiveness of the organization. Assist our clients in improving the effectiveness of their marketing and communications programs by adopting a pro-active and systematic approach to planning, development, delivery and evaluation. Please fill in the below form or call us 613-882-5684. 613-882-5684.